Dr Rabinovich is the leading San Francisco oral surgeon who can cure sleep apnea. If you suffer from sleep apnea it can cause misery for your partner as your snoring will keep him or her awake at night, while you may not even know that you suffer from it. However, it can be cured. 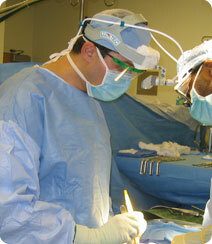 The leading sleep apnea specialist (surgeon) in San Francisco is Dr Alex Rabinovich. Dr. Rabinovich will evaluate you, and give you a range of options for your sleep apnea. Our office is convenient to San Francisco, being located in the financial district. What, exactly, is sleep apnea? The most usual form of sleep apnea is obstructive sleep apnea. It is actually quite common and occurs because the airway collapses during sleep and becomes blocked or partially blocked. This causes a pause in your breathing or very shallow breathing. Pauses in breathing can last for a few seconds or as long as several minutes and can occur up to 30 times in an hour. When breathing commences again there can be a loud snort or choking sound. If the airway is only partially blocked, any air that manages to squeeze by the blockage will be accompanied by a loud snoring sound. There is another type of sleep apnea called central sleep apnea where the brain fails to send the correct signals to your breathing muscles causing pauses in breathing. However, this is much less common than obstructive sleep apnea. If you think you may be suffering, you should consult Dr Alex Rabinovich, who is among the best sleep apnea surgeons in San Francisco. Obstructive sleep apnea is more common in people who are overweight, but can affect anybody. It can lead to high blood pressure and diabetes, and it can increase the chances of a stroke, or heart attack. It can also lead to obesity and arrhythmias, which are irregular heartbeats. Sleep apnea is a chronic, or ongoing, condition and will continue unless treated. Most people who have sleep apnea are not aware that they are suffering from it because while it occurs they are asleep. However, it can keep your partner awake night after night. It is also one of the most common causes of sleepiness during the day and can lead to road accidents and work accidents. If you believe that you or your partner may be suffering from sleep apnea you should most certainly consult a sleep apnea surgeon in San Francisco such as Dr Rabinovich. This entry was posted in Blog and tagged oral surgeon, Oral Surgery, San Francisco oral surgeon, Sleep Apnea on August 14, 2016 by Dr Alex Rabinovich.